The 2016 Meridian~Kessler Business Breakfast took place this year on November 14 hosted by The Riviera Club. Filling the Dining Hall were a large number of family, community and corporate businesses representing a balance of the diversity in our thriving area. Patrick Lane and Nick Colby of MKNA present the 2017 Sid Maurer Award for Outstanding Business Leadership to Trikam Parmer of Artcraft Upholstery Company. Patrick Lane, Chair of the MKNA Business Committee presented the “Sid Maurer Award for Outstanding Business Leadership.” This award is named in honor of Sid Maurer, who with his wife Eleanor, owned and operated the Atlas Supermarket for 55 years at the corner of 54th Street and College Avenue. Sid and Eleanor were beloved by their customers and the community, largely due to the personal relationship they built with their customers. Sid defied the logic of the grocery business— one of the most competitive industries in America with super low profit margins— by never expanding beyond his single location. He managed to keep the business running financially through good times and bad. Sid would often find and order items simply at a customer’s request. And if a customer was a bit short on cash, he might let them slide, extending old school style credit for their groceries until they received their next paycheck. The Sid Maurer Award now has roots in strong tradition, and this year honored local business owner Trikam Parmar of Artcraft Upholstering Company at 52nd and College. Trikam has called Meridian~Kessler home since 1978. 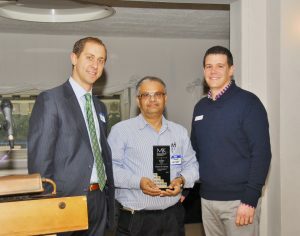 Originally from India, he moved to the US where he decided to go into the family business of custom furniture building. He developed the skills of the trade from his father and uncles who studied under master craftsmen in England. In 1951, Artcraft Upholstering Co was started by Kenney Herron. In 1998, then owner Jeanne Browne decided to retire and sell the business to Trikam Parmar, who remains the current owner. Trikam has always been involved with MKNA … its programs, projects, and advisory council. He was exceptionally helpful with the Envision College Avenue series and has always extended himself as a resource of thought and information. Congratulations to Trikham! We applaud his many successful years as our neighbor and are proud to support our local Meridian~Kessler businesses. 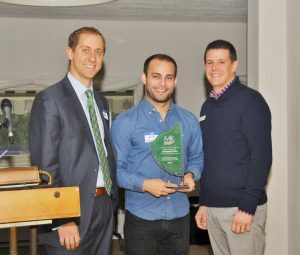 Patrick Lane and Nick Colby of MKNA present the 2017 Meridian-Kessler Stimulus Award to Nick Wangler of DeveloperTown.  This year, MKNA created the Meridian~Kessler Stimulus Award to recognize a newer business that is making a strong, positive impact on the Meridian~Kessler neighborhood. This year’s recipient of the Meridian~Kessler Stimulus Award was DeveloperTown, a design and development firm that helps entrepreneurs launch web and mobile products. 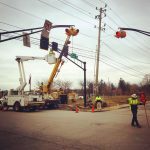 They have been a pioneer in helping to revitalize a downtrodden industrial area at 54th and Winthrop Ave. next to the Monon Trail. Their presence and efforts have helped to not only bring more business to the area but also to contribute in making the Monon Trail the gem it is today. This company is currently “incubating” 70 new businesses and is itself growing by a staggering 30% annually. It has been recognized by the Wall Street Journal, Forbes, Fast Company and The Economist just to name a few. DeveloperTown was recently invited to the White House to speak as part of the Startup America Partnership. Nick Wangler, director of marketing, accepted this now to be annual MK Stimulus Award and gave the audience an informative glimpse of the history, progress, and successes of DeveloperTown. Presenters at the Business Breakfast were District 2 Councilor Colleen Fanning, Deputy Mayor of Economic Development Angela Smith-Jones and Director of Business and Neighborhood Services Jason Larrison all of whom gave remarks focused on the magnetism of strong neighborhoods. 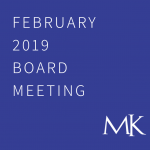 They discussed concepts of how to continue building on the assets of Meridian-Kessler and its larger arena, retaining the essentials and stimulating new business. Each spoke to the relevance and application of their specific area in the process of business vitality. All in all, it was a great way to start the day. If you missed this year, make sure to be there in 2017!